Home » celebration , transformers » The Transformers are 25 years old! The Transformers are 25 years old! The good crew at Seibertron.com have made note that this is a special weekend for Transformers fans. 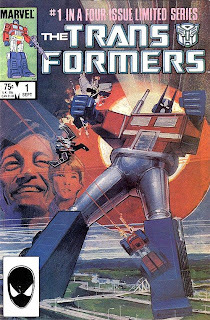 It was twenty-five years ago yesterday, on May 8th 1984 that The Transformers issue #1 was published by Marvel Comics. It was the first product ever released for the Transformers franchise. A quarter-century later with bajillions of toys sold, not to mention multiple television series and comic books and video games and a third motion picture arriving in theaters later next month, well... hard to believe it all started with a seventy-five cents comic book, eh? Happy Birthday Transformers! And to quote that old Cybertronian proverb: "May your luster never dull and your wires never cross." I loved Transformers as a kid. It was my favorite toy line and favorite cartoon (maybe tied with Voltron). It's interesting to know that it started with comics. I figured the toy line came first and that the cartoon was an entertaining ad campaign for the toys. The only bad thing about Transformers is that it has Highlander syndrome and reboots itself upon every new incarnation. I can understand it being updated for every new generation (especially the vehicle forms), but if I understand correctly, the comics had a different storyline from the cartoon, Transformers Animated has a different storyline, and every mini-series on the Cartoon Network (such as Armada -- I think they were imported from Japan) has a distinct origin story. I wish Transformers would start over with one final, fresh reboot (ala Star Trek) and stick to a single, definitive, canon timeline. Regardless, Transformers is one of those timeless obsessions. I still have to check out Transformers in the toy aisle every time I'm in Target, even if I only like half of them. Even though I think Michael Bay crapped all over my childhood with the first live-action Transformers, I still insist on the seeing the sequel. There's a guy at YouTube with username Peaugh that does reviews of the toys. They're basically just videos of him transforming the toys and talking about them, and I can waste a lot of time watching them with fascination and some temptation to go out and buy some of the toys for myself -- despite the fact that I'm 33. I think I might watch Transformers the movie this week...on VHS of course!